On steps: Daisy Louise (nee JOHNSTON) BOORMAN and her brother Russell Kerfoot JOHNSTON. her mother Eliza Jane (nee NEELAND) KERFOOT, Della E JOHNSTON, Irene JOHNSTON (later DELISLE). Old family photos hold secrets, especially when there are no captions, and we're still struggling with this one. Although no formal caption was written on the back of the above photograph, the people in it had previously been identified by older family members. It was taken in 1911 and depicts the infant Bill BOORMAN (Terry’s father, born on 16 Jan 1911) and his extended JOHNSTON family on his mother's side. Another portrait, taken on this same occasion, includes only baby Bill and three female adults (as shown in a previous post about Bill Boorman’s life). Both these photos are very important family keepsakes as they include four generations of Bill BOORMAN's female JOHNSTON, KERFOOT and NEELAND ancestors.​ Bill’s father Harry Eustace BOORMAN isn’t even included! ​We had always assumed that these photos were taken to commemorate Bill’s baptism. The family is obviously gathered together in formal dress, and it was an important enough occasion to warrant having formal portraits taken (presumably by a professional photographer). However, Bill’s colourful baptism certificate says that he wasn’t baptized until 22 Aug 2013 at 1419 Harwood Street in Vancouver by his Uncle Samuel Fletcher KERFOOT, a Methodist Episcopal minister then living in North Dakota. Bill was then two and a half years old. So I think this 1911 photo is simply in honour of Bill’s birth as the first grandchild on this JOHNSTON side of the family. One would assume that this important birth celebration would also take place at the family's home. But look again at this photo, and focus on the house rather than the people. What address was it? The house number is partly shown in the shadows above the front door, but unfortunately the tops of the numbers are cut off. When I first looked at a slightly trimmed version of this photo, it looked like the address was 1407. But I now realize the house number is almost certainly 1409. Not a match for 1419; it's off by 10. I'm sure this is just wishful thinking, but could the street numbers on this street have been revised around that time period, and the actual number on the house not yet been updated? I so want this to be Deborah’s house in the photo! If not, then which street and which city are we truly looking at? And whose house was it? Although baby Bill BOORMAN had been born in California when his parents were on a temporary visit there, the JOHNSTON family had been living in Vancouver BC Canada since about 1890, having moved from Ontario to Manitoba before journeying to the west coast. By 1910 some of the family was living at 1419 Harwood Street, including Daisy Louise’s mother Deborah and her grandmother Eliza Jane, both widows. Daisy Louise’s father James Irvine Johnston had died in Vancouver in 1900 (no address recorded on his death registration), her grandfather James Elden JOHNSTON in Vancouver in 1901 (no address), and her widowed maternal grandfather Samuel KERFOOT passed away in 1906 at 1041 Burrard St, Vancouver. With the surviving widows living together at 1419 Harwood, that would have been the logical place to hold a family celebration. In my research collaboration back in 2016 with Randi, a Johnston second cousin, we wondered if they might have used a neighbour’s porch, perhaps because it was larger or better suited for the photo. So we searched city directories, census and old maps trying to see if such an address existed. On modern maps, their house and its neighbours no longer exist, replaced with a utilitarian 1950-ish apartment or condo building now called Sunrise Court. In fact, there are no single family dwellings left in this area - how sad. Harwood parallels Beach Ave and is two blocks off Sunset Beach Park. Prime real estate! House number 1419 on Harwood is between the Broughton and Nicola cross streets, and if there had been a house numbered 1409, it would have been replaced by the apartment building on the corner at 1315 Broughton Street. 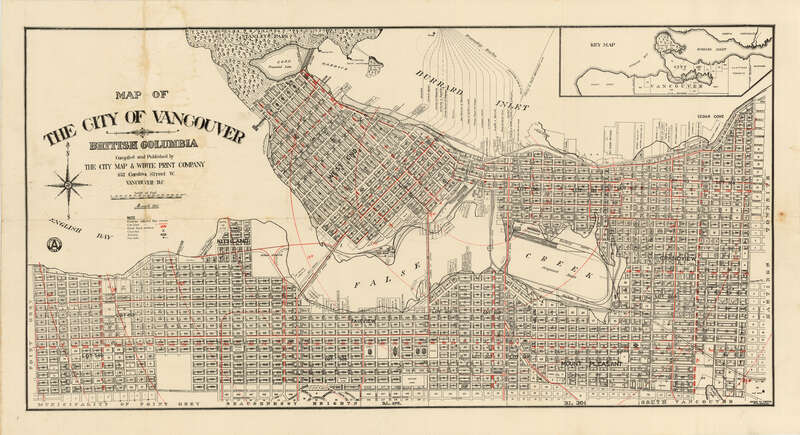 With a bit of digging, I have found two different Vancouver City maps online from this period. The first is the 1911 map by the White Print Company which shows surveyed lots and blocks and street names, with civic block numbers in red, but no individual civic addresses. So while it's a good overview map of Vancouver, it's not much help with our quest. Then just today I found the online collection of Goad’s Fire Insurance Interactive Section Maps from 1912 which includes the civic address, lot dimensions and the outline of buildings on the lots. As shown on the following map, I found 1419 Harwood in District Lot 185, on a 66 ft by 131 ft lot backing onto a 33 ft lane. The large square wooden house in Block 51, Lot 19 was situated closer to the front and right boundaries of the lot, and a small square garage or shed was right off the back lane on the right side boundary (yellow references a wooden structure). If the outline of the house is correct, it didn't have a veranda that jutted out into the yard, which the one in the photo may have had. It would be nice to see an old photo of the full front of the house to be sure. showing the location of 1419 Harwood Street, home of the widow Deborah S JOHNSTON. The City of Vancouver Archives may well have further information on this property, but that will likely require a personal visit if I want to learn more about this JOHNSTON home. One of the problems I'm still having is that I can’t find this family in the 1911 census. Was there a section missing from the census pages, or was it badly transcribed, or had she moved out of province? In the 1910 Henderson City directory, Deborah (widow of James) was living at 1419 Harwood, but in 1911 she is not listed at all in the directory Looking for that address, her home was then occupied by a Francis J Gillespie (I don't know who he was). But the following year in 1912, Deborah is back at that address (also in 1913 and 1914 at least). Did she rent out her house and go on an extended holiday to California to help her daughter through Bill’s birth? But if this was the case, I've been unable to find any record of her relatively brief stay there. The US census in 1910 was too early to record them. Of course I may be way off the mark with this theory. There was no house number 1409 listed on Harwood in the directories or on the above map, so we need to keep looking elsewhere for the house in the photo. It may belong to another relative or even a family friend. I have found some of the other members of this Johnston family at different residences in Vancouver in 1911, but none at an address containing the number 1409. Baby Bill BOORMAN and his parents were living as 1209 Jervis in a big apartment block (another number only 1 digit out!) Could the whole JOHNSTON family been visiting their BOORMAN in-laws in Victoria where baby Bill's paternal grandparents and other relatives lived? Or what about the KERFOOT relatives in Vancouver? We've searched both without success. A California address would be a long shot, only if all Vancouver Johnston relatives also traveled there to visit the new baby (and be included in the photo) before everyone returned to Canada in time for the 1911 census. So the identify of the house in the photo remains a mystery, and the search continues.